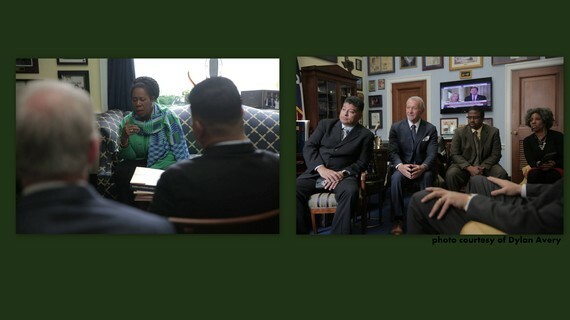 During a recent trip to Capitol Hill, members of the National Coalition of Law Enforcement Officers for Justice, Reform and Accountability (NCLEOJ) met with Rep Sheila Jackson Lewis, co-sponsor of the "Building Bridges and Transforming Resentment and Unfairness to Support and Trust for Municipal Law Enforcement" or "Build Trust Act". This multi-cultural group of retired and former police officers met with Rep. Jackson Lee of Texas to share and discuss their varied personal experiences with regard to institutionalized racism and the unnecessary state-sponsored murders of all Americans; placing particular emphasis on the black and brown communities. There were shared stories and opinions offered by the NCLEOJ as it relates to ways in which police departments can begin to rebuild trust within the community. These officers brought forth personal professional experiences from major metropolitan police departments across the nation such as Los Angeles, St. Louis, New York, Philadelphia, East Orange, New Jersey and the U.S. Marshal Service. To this extent the NCLEOJ intends to collaborate with Rep Jackson Lee and has been offered an opportunity to speak to these issues before legislators next month. The NCLEOJ has also partnered with the victim family of Oscar Grant, who was killed by a BART officer in Oakland, California and was the subject of the movie Fruitvale. In addition to the senseless death of Oscar Grant, NCLEOJ is committed to demanding justice for all victims and their families adversely effected by the actions of overzealous police officers across the nation which have resulted in either death, serious bodily injury, or unjustified incarceration -- as in the cases of Mike Brown - Ferguson, Missouri; John Crawford III - Beavercreek, Ohio; Tamir Rice - Cleveland, Ohio; Eric Garner - Staten Island, New York; Ezell Ford - Los Angeles, California; Darrien Hunt - Saratoga Springs, Utah; Sureshbhai Patel - Madison, Alabama and William Wingate - Seattle, Washington. Our collective voices are now magnified and unified as we demand an end to the pandemic of deadly force being perpetrated by some in the law enforcement community and a level of accountability, by those who commit these atrocities, commensurate with the offense.